Q: How will OLPC work with Intel technology? A: Initially, OLPC is planning to add Intel Xeon processor based servers to their product offerings, taking advantage of world class performance, reliability and energy efficiency. In addition, Intel is developing a system board design for OLPC consideration in their next generation XO device. We are also beginning to explore more wide ranging technology and product collaboration that will bring exciting new technology innovations to children around the world. Reading that, I say bye-bye to the current XSX school server motherboard, a fanless Mini-ITX from VIA Technologies. I also see the next generation XO-2 dropping the XO-1's AMD Geode LX-700 processor for Intel’s 2008 Mobile Internet Device (MID) platform. For, as I predicted, Intel sees the OLPC demographic as a sales market, not a philanthropic mission, as any big corporation should, and invested in OLPC to dominate developing world computing. Now the real questions are: Will Intel inside OLPC be good or bad for XO functionality? For OLPC's educational aims? For children and computing in the developing world? Couldn't this boil down to the same argument made about including a Microsoft OS in the XO? What are the main issues when including a large corporation in a program that is supposed to be philanthropic besides the too easily relied on liberal guilts? In the end it's: does it matters? For the user, it's completely transparent for the user what's inside. If it's faster and cheaper, and don't think it really matters whether there are magic gnomes inside. The question is: IS IT faster or cheaper? In the microsoft case, the user experience changes radically whether there is a sugar or a the "starter" version of windows on it. It's a big day for intel though. The answer is yes its good for OLPC. Here's the truth. The Geode is slow. Really slow. It has taken OLPC a lot longer to get to market than they originally claimed in part because the Geode is underpowered and it took a lot of software work. Well, both AMD and Intel are actually working on new low-power platforms for UMPCs (Ultra Mobile PCs) which could well be used in an X0-2. Intel's Menlow seems to be closer to being finalized than AMD's Griffin but it remains to be seen which solutions proves to be more suitable within the limitations of the OLPC target-environment. If Intel can provide a faster and cheaper processor, and especially a fanless processor that consumes less power, integrates with the DCON and more. Today Intel does not have this processor as far as I know. If anyone knows of an Intel alternative (in terms of power consumption, fanlessness, price and speed) to AMD Geode LX-700, then please post it here. So one can bet on Intel's Menlow MID processor supposedly coming in 2008, but who knows if they really will be x86 and fanless? Who know's if MID will work with DCON which is so central to XO's power managment (it can turn off and resume the processor in milliseconds to have it turned off most of the time). Both Intel and Microsoft have only one goal, and that is to monopolize using whatever means necessary. Intel keeps creating chips that need more power and more cooling fans, and Microsoft keeps bloating it's software to need a faster chip. I don't care if the Geode is slow, and I don't think the children in rural areas will care either. The extreme lack of power is what forced the current architecture in the first place. With the current motivation to gain a larger market share I doubt the intel version will be fanless. Did Intel ever do a fanless ultra low power x86 CPU? Although I guess that it could be considered that something like the Xscale ARM based chip or some other ultra ultra low power fanless chip could be used to power the XO-2 or XO-3 and to be really able to lower the cost to $50 a laptop by the end of 2008. The Linux apps would then "just" have to be ported over to embedded form to work on a cheaper lower power ARM + DSP platform. Texas Instruments does those embedded low power, low cost and still high performance systems good with their DaVinci solutions. My company makes a high performance graphics middleware for linux (http://www.microxwin.com). Recently we ported the whole kde desktop to a 400mhz MIPS based Au1200 chip. The BOM cost for such a solid state PC would be ~ $50/- in low volumes while consuming very little power. So if you are looking for a low cost PC, solution, we have one. "X Window Systems is a standrad graphics framework for Unix/Linux desktops." I have little respect for a company that has a typo in the first line of text on their website. There are hundreds of options for low power processor designs. The issue is how much power is needed to how much power is used. If a benchmark is set (Megaflops?) and an accurate grunt level is figured out perhaps it would be easier to sort the wheat from the chaff? Unfortunately its not a simple matter of "Operations Per Second / Watts Of Power". I'm not too sure Intel will get there, but if the specifications are rigorously used for total power budget and no moving parts at as Guinness record book has it more than 10% better on all specs let the games begin. Total system budget needs to be important as well. This has the chance of lowering costs and parts to a single chip solution. And guess who will win a single chip solution currently? Via as they have already demonstrated with the C7Chrome solution fanless at +1 gig. Look at the Everex stepnote in Walmart. Partner up with Walmart sponsor the design competition and stand back for the fun! One other point I wanted to raise was orders of magnitude in power consumption. Intel low power devices currently run at around 10 watts power consumption. Devices like the PIII (KC80526) in a low power design to run at 1.35Volts and clock frequencies from say 400 to 700 MHz use 10 times the amount of current that the AMD Geode uses. Now I'm no microprocessor genius but I have been around this stuff for a long time. The faster you run a device, the hotter it gets and the more power it uses. Very hard to get away from that fact unless you increase the efficiency of the device. The real problem is the market has always been after faster devices. The research dollars have always gone to chips that do stuff fast. No one cares about power consumption. We have 500 watt power supplies in desktop PCs. Why would we care. There's a huge power station providing us with electricity. Now, OLPC comes along and says, "Hey Intel, we'd really like a processor that uses less than a watt of power but does stuff fast". The good news is, we want a million a month. It seems to me that AMD is a lot further ahead in the specialist Embedded Controller low power market. Its their niche market and they do it very well. Intel is all about speed and the desktop PC. Intel's all about making a buck. If they can do it selling processors for pimped-out game machines, that's what they'll do. When the desktop was where to make money they made processors for the desktop. When the market for servers optimized for server mega-farms appeared Intel started emphasizing power efficiency, i.e. gigaflops/kWh or some such rather then raw computing power. As I've stated before the XO's greatest service may come in the form of having drawn the attention of corporations which simply didn't have the low end of the computing market in their perception. Moore's law has finally driven the price of ICs down to the point that enough computing power to do all sorts of worthwhile tasks. The computing power is now cheap enough to sell to a segment of the market that was previously unreachable. The XO is a red flag drawing attention to that market. You couldn't make a computer cheap enough for an average poor person to find useful at a price they could afford and make a profit. Not that there weren't attempts but the proposed solutions were too limited to have much appeal or expected too much of potential customers. The XO makes it clear that those days are past and the commercial community has taken note. But this is just the opening salvo in this market. I expect the size of the potential market to attract all sorts of players, and cause prices to drop rapidly. I wholehearted agree with you. OLPC is already a success without the first government sale itself, for its turned the IT industry's attention to the developing world. Where once laughter was heard when you mentioned "Africa" to a major IT company, now big firms like Intel are hyper-focused on the needs of African, Asian, and South American non-"BRICS" governments and businesses. A wonderful and remarkable change. 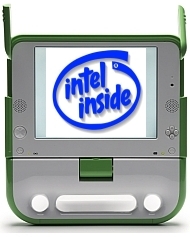 when intel couldnt kill the olpc by calling it a gadget, etc. they decieded to dominate it. their offer was a trojan horse, they're matching the "letter" of what olpc wants, which is more competition, better products, etc.... but not the "spirit", because their intentions are entirely evil, as intel's intentions always are. they'll do their old tricks, like sell their chips at a loss, just to lock AMD out. they'll say what are you complaining about? these chips are so cheap? this is great for competition! but of course, only until they get their monopoly, then they don't even need to pretend. for them, this is just another way to screw AMD. intel hates competition. look at amd's lawsuit, or korea's or the EU's or japan's successful one against intel for anticompetitive practices. So, from the original post, and some subsequent comments, I gather that Intel is being portrayed as bad because they are only in it for the "wrong reasons"? In my original post I didn't imply that Intel is bad or with OLPC for the wrong reasons. Intel is with OLPC to increase its market share, which I do not think is inherently good or bad - its just what any corporation should do. In fact, an Intel desire to increase market share through a more powerful yet as energy efficient computer would be a great benefit to OLPC especially since its market cap, and therefore resources, is so much greater than AMD or VIA. never mind those bad comments about intel focused on what you achieved so far. I definitely agree. Never mind the bad comments, been working with Intel products long since. think of the benefits. This is actually a good program from Intel. the ends justify the means. They MAY be in it for the wrong reasons, but they're doing nothing wrong.